ITAHARI, May 21: With the identification of nine additional wild buffaloes in Koshi Tappu Wildlife Reserve (KTWR), the number of wild buffaloes in Koshi Tappu Wildlife Reserve has increased to 441, a slight increase compared to the last census held two years ago. The result of the census taken from April 10 to 13 was publicized on Sunday. According to Ganesh Prasad Tiwari, information officer of KTWR, 38 of them are one-year old calves, 40 are two years old, and 35 of them are of middle age. 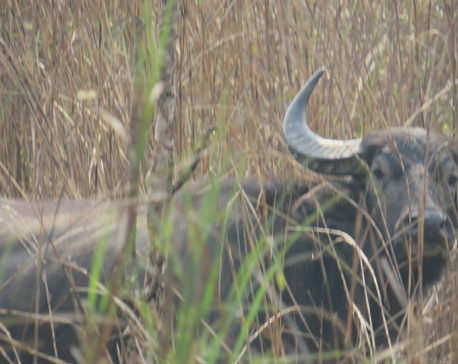 Likewise, there are 191 grown up female buffaloes and 136 grown up male buffaloes in the reserve. Until two years ago, there were 432 wild buffaloes in KWTR. Earlier, ten females and three males were transferred to Chitwan National Park (CNP). Though they were transferred with the objective of protecting them from epidemics and providing them a new habitat, they struggled for survival there. Four of them lost their life in the CNP while others were taken back to KWTR. In the last two years, five buffaloes died of natural death while four died to territorial fights, according to Information Officer Tiwari. As per the census of 2014, there were 326 buffaloes in the reserve. In the beginning, there were only 73 wild buffaloes in the KWTR but the number of the rare species has been increasing at the rate of 8.1 percent every year. The average life expectancy of a wild buffalo is 25 years and it can give birth to five calves in its lifespan. This buffaloes is found only in five countries of the world including Nepal. With the increase in the number, wild buffaloes have started struggling for habitat. This has compelled them to enter human settlements which has ultimately increased human-wildlife conflict. "It has been difficult for us to provide compensation to the victims due to human-wildlife conflict," said Shyam Kumar Sah, a conservation officer. In the recent years, people living in the buffer zones are suffering a lot due to wild animal menace. Buffaloes often run into the fields and damage their crops which they grew with so much hard work. In fact, this has affected the relationship between the locals and KTWR authorities. Ayub Ansari, chairperson of Koshi Rural Municipality, stressed that the central and provincial governments should make efforts to mend this relationship. Meanwhile, Jagdish Kushiyat, minister for industry, tourism and forest in Province 1, has assured to make KTWR an exemplary tourism destination. He also promised to provide timely compensation to the victims. A total of 84,423 people live in the buffer zones near KTWR.